Hunt is renowned as one of the world’s greatest artists for his bold use of colour, attention to detail and elaborate religious scenes. The Lady of Shalott, based on the famous poem, was highly commended at the time and is still considered one of the works in art history. About the artist: William Holman Hunt (1827 – 1910) was an English painter and one of the founders of the Pre-Raphaelite Brotherhood. His paintings were highly praised throughout his life for their attention to detail, vivid colours and religious significance. Hunt was influenced by the writings of John Ruskin and Thomas Carlyle, according to whom the world itself should be read as a system of visual signs. Hunt felt it his duty to reveal the correspondence between sign and fact. 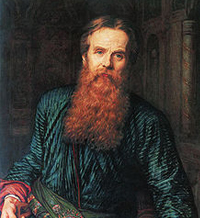 Of all the members of the Pre-Raphaelite Brotherhood, Hunt remained most true to his ideals and beliefs throughout his working life. He was always aware of the popular appeal and public visibility of his works. Hunt was religious, and in the mid-1850s, he travelled to the Holy Land in search of accurate material to inspire his paintings. It was here he painted some of his most famous works: The Scapegoat, The Finding of the Saviour in the Temple, and The Shadow of Death, along with many landscapes of the region. Hunt also painted works based on poems, such as Isabella and the highly commended The Lady of Shalott. He eventually built his own house in Jerusalem. Hunt died in 1910 and is buried in St Paul's Cathedral in London.